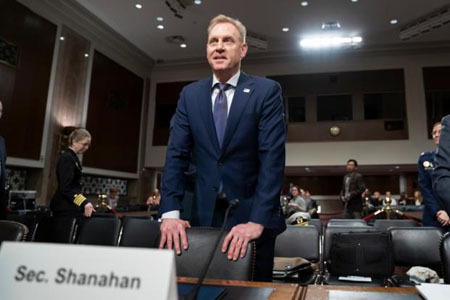 The Pentagon’s proposed $718 billion budget for 2020 is designed in large part to counter the threat from China and its rapidly advancing military technology, acting Defense Secretary Patrick Shanahan said. “We’ve been ignoring the problem for too long,” Shanahan said. Shanahan said the 2020 budget includes $25 billion for nuclear weapons that are meant in part to stay ahead of China’s nuclear arsenal, which is much smaller than America’s but growing. Shanahan told the committee that China is developing a nuclear-capable long-range bomber that, if successful, would enable China to join the United States and Russia as the only nations with air-, sea- and land-based nuclear weapons. Shanahan also noted Beijing’s advancement in hypersonic weapons against which the U.S. has limited defenses; space launches and other space efforts that could enable China to fight wars in space; the fact the China is “systematically stealing” U.S. and allied technology; and the militarizing of land features in the South China Sea. As deputy defense secretary, Shanahan and former Defense Secretary Jim Mattis crafted a national defense strategy that put China at the top of the list of threats. “As China continues its economic and military ascendance, asserting power through an all-of-nation long-term strategy, it will continue to pursue a military modernization program that seeks Indo-Pacific regional hegemony in the near-term and displacement of the United States to achieve global pre-eminence in the future,” the defense strategy document said. Countering China has permeated the thinking of the entire U.S. military, Gen. Thomas Waldhauser, head of U.S. Africa Command, said last month. Waldhauser noted that dozens of African heads of state were invited to Beijing last fall to consider billions in Chinese loans and grants, and that China is building thousands of miles of railroads in Africa, mostly linked to Chinese mineral extraction operations. “They’re heavily invested and heavily involved” in Africa, he said. The top U.S. commander in Europe told Congress last week that China also is making inroads in Europe. “China is looking to secure access to strategic geographic locations and economic sectors through financial stakes in ports, airlines, hotels, and utility providers, while providing a source of capital for struggling European economies,” Gen. Curtis Scaparrotti said.